Now to tie this back to Down syndrome: Historically, babies with Down syndrome were generally (and automatically) placed in a children's home and, basically, forgotten. Once there, they received no special care or attention, just the most basic of needs (food and diaper change)... for the rest of their lives. There were no expectations of these people becoming active, contributing members of society. They were considered and labeled as retarded. A lot has changed! We now know that people with Down syndrome really can learn and develop into contributing and well-loved members of society, when given a chance. Some doctors still think of the "retarded" label, but the intelligence of a child with Down syndrome may be affected to varying degrees by the extra chromosome. 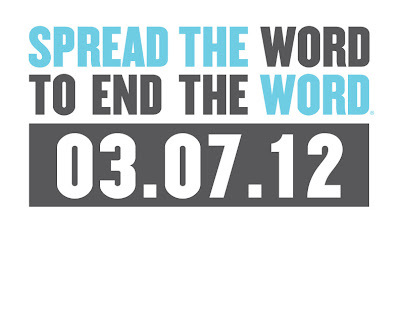 Click over to R-word.org and take the pledge to eliminate the use of the R-word. It may be harder than you think. It is a derogatory word that I have heard used a lot. I've used it. My husband and I are very much in the middle of realizing how much we use this word ourselves to refer to things that are annoying or don't make sense. "The layout of this store is retarded." 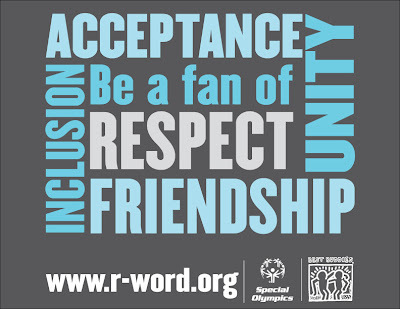 Don't get caught in the company of families affected by Down syndrome saying the R-word! You are sure to offend. The same goes for "short bus" references. Speaking of people with Down syndrome, they are just that: people with Down syndrome. In case you don't catch my drift, it is uncool to refer to people by their "condition." For instance, you would never say "I work with a cancer lady," would you? (I presume you might say "I work with a woman that has cancer.") Then why would you refer to a "Down syndrome kid?" We are humans first. Choosing one feature or trait and sticking that in front of person, kid, baby, etc. lessens the humanity of the statement. It lessens the recognition that they are a human being. It is disrespectful and poor etiquette. As for when someone you know announces that their unborn (or even newborn) child has been diagnosed with Down syndrome, you can expect to not know what to say. Worse yet, there is absolutely no right answer here. A family wants to be congratulated for a new family member, but may be mourning the perfect baby they expected to have. Or perhaps the parents are taking the news in stride and "I'm sorry" will offend. And no matter how much you think it might help, "those tests are wrong all the time" does not help. "Those tests" (karyotyping via amniocentesis or after birth) are not wrong all the time. They are over 99% accurate. So no, saying "maybe the results are wrong" doesn't help. Telling expectant parents that if mother eats very healthy and takes good care and if they wish (or pray) hard enough, maybe all will turn out fine... nope, another bad idea. Most importantly, do not ask what the mother did wrong during pregnancy to make this happen! There is nothing a mother can do to cause a child to have Down syndrome! Mothers face enough internal guilt without outside help. What an ugly thing to suggest! For me, I took some offense to apologies. I decidedly took them, though, and processed them as "I'm sorry that your child will have extra health concerns." 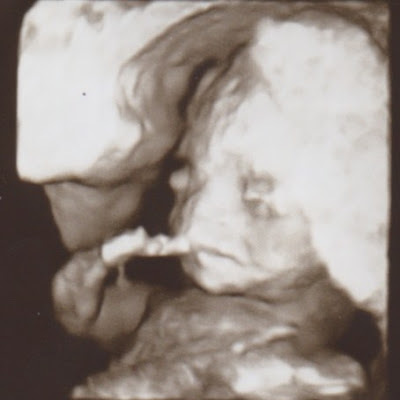 As we announced that our unborn son was diagnosed with Down syndrome, I made a point of also saying "and we're okay, really." I said it because we really were (and are) okay. I didn't want a bunch of pity. I don't need it. Spencer is our son and we love him, all of him - even that extra chromosome. Another no-no: suggesting termination. Termination is a very personal choice and is none of your business. The doctor and/or genetic counselor will make sure the expectant parents are aware of this option, as well as adoption. The best thing you can do is just be supportive, period. There is only one more Friday left in the month! Do you have any questions about Down syndrome? Please feel free to comment with questions. I'd be quite happy to answer either in private email or in my post next week. Thank you for tuning in this week! I'm loving these posts, Jorje! 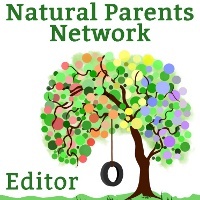 Please consider writing one a month, including information you may uncover in your research... PLEASE? Thanks for this, Jorje. Sadly, the issue of calling things "retarded," is pretty pervasive, but then I have seen so much awareness raised in recent years, so hopefully it's on its way out. It's always interesting to me to read the work of psychologists and child development theorists like Piaget and Montessori, who are now dead and gone. They use words to refer to children that make me gasp, but I have to remind myself that this was the language of their time. We have definitely come quite a way with developing more sensitive language, and I hope it continues! This is a wonderful post! Before I was married I worked with children with developmental disorders (never a child with Down Syndrome though), my mother and my cousin both had pregnancies that ended in stillbirths because of (hereditary) additional chromosomes in the developing baby. Because of this I've often asked myself what I would do if I had a child with autism or Down syndrome. I've never been there, never experienced it, but I know that if I were ever to have a child with a disability that child would be loved. Thanks for taking the time to write such a wonderful article.